Q: What are the main concerns when dealing with CO2? Always connect CO2 gas cylinder to reducing valve or regulator. Failure to do so could result in an explosion with possible death or injury when the cylinder valve is opened. Never connect gas cylinder directly to keg. Always secure gas cylinder in 'upright" position. Always keep gas cylinder away from heat. Never drop or throw CO2 gas cylinder. Always ventilate after CO2 leakage. Always check the D.O.T. (Department of Transport) test date located on the neck of the cylinder before installation. If over five (5) years, do not use, return the gas cylinder to gas supplier. Never connect a product container unless there are two (2) safety mechanisms in the pressure system. One at or on the CO2 regulator (the regulator supplied should be inclusive of such a safety mechanism). One at or on the product container coupler or in the pressure gas line (the keg coupler should be inclusive of such a safety mechanism). If it becomes difficult to breathe and your head starts to ache, abnormal concentrations of carbon dioxide may be present in the area. Close the main valve on the CO2 cylinder and leave the room immediately. Gas cylinders should be stored in the coolest part of the establishment, preferably at 70 degrees, and securely fastened in the upright position before the primary regulator is attached to the cylinder. Q: What are the main components of a regulator and what do they do? Q: At what pressure should I run my CO2 regulator? A: For the standard 5 ft. run found in kegerators and most kegerator conversions, 10-12 PSI is recommended. Longer draws in commercial establishments and jockey boxes require higher pressure depending on the distance the beer needs to travel. Once set, you should monitor the regulator to ensure the pressure remains constant at the desired level. The values in this table assume sea-level altitude, beer specific gravity of 1.015, and beer alcohol content at 3.8% abw or 4.8% abv. Values shown are in psig, or gauge pressure. It's important to remember that carbonation is proportional to absolute pressure, not gauge pressure. Atmospheric pressure drops as elevation goes up. Therefore, the gauge pressure needed to achieve proper carbonation at elevations above sea level must be increased. Add 1 psi for every 2,000 feet above sea level. For example, a retailer at sea level would use 11.3 psi gauge pressure to maintain 2.5 volumes of CO2 in beer served at 38F. That same retailer would need 13.3 psi gauge pressure at 4,000 feet elevation to maintain 2.5 volumes of CO2. Q: How do I set my CO2 regulator? Securely attach the regulator to the gas cylinder. Close the regulator's shut-off valve "C". Completely open the gas cylinder valve "A". Slowly turn the regulator adjustment "B" until the low pressure gauge "D" displays the desired pressure. Turn clockwise to increase the pressure, and counter-clockwise to decrease the pressure. Open the regulator shut-off valve "C" to allow gas to flow to the keg coupler. 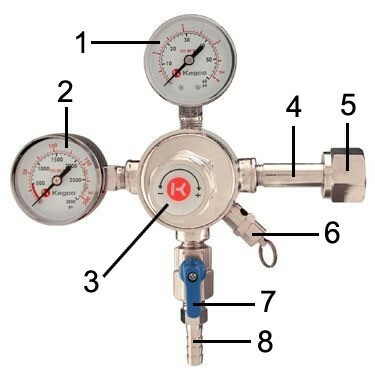 As the keg pressurizes, the needle on the low pressure gauge "D" will drop temporarily until the pressure has equalized, and then will return to the point you previously set it at. Briefly pull the ring on the keg coupler's pressure relief valve "F" again to allow gas to flow through the regulator to obtain a more accurate reading on the low pressure gauge "D". Re-check low pressure gauge "D" and use regulator adjustment "B" to readjust if necessary until the desired pressure is displayed. If you will be dispensing multiple kegs that use the same CO2 pressure, you can split the gas flow to each keg using a two product regulator or an air line distributor. However, if you will be dispensing multiple kegs with different pressure requirements, secondary gas regulators will be needed to adjust the pressure for each keg. Q: How Do I Find a Leak in My Regulator? Q: What size CO2 tank should I buy? Q: How do I replace an empty CO2 cylinder? Unscrew adjustment screw "B" (counter-clockwise) as far as it will go. 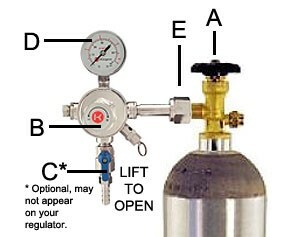 Remove regulator from empty cylinder at "E". Remove dust cap from new cylinder at "E". Open and close valve "A" quickly to blow dust from the outlet. With cylinder valve "A" in closed position, reattach regulator to cylinder at "E". Be sure to include the CO2 washer. Open valve "A" all the way (this is important because the cylinder valve seals in two places). 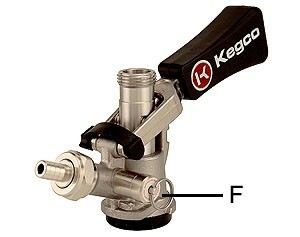 Readjust regulator pressure "B" and open optional valve "C".